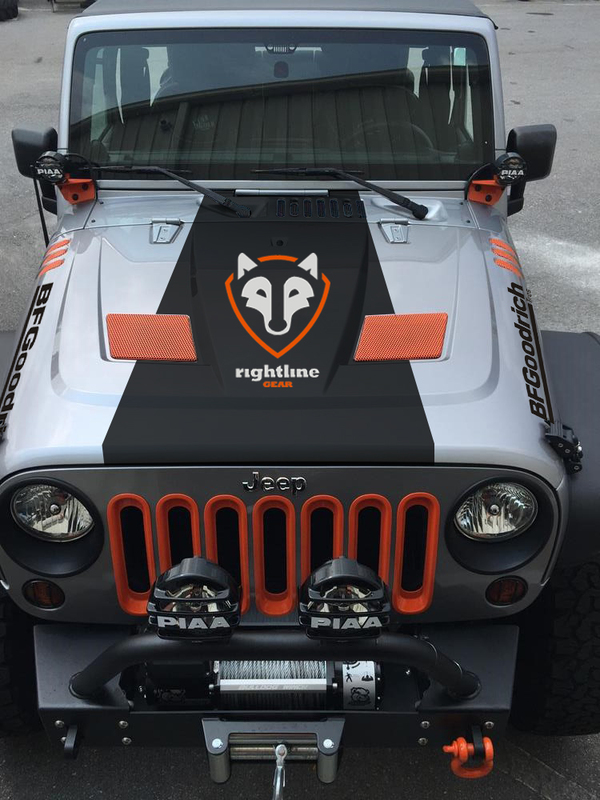 The crowning piece to our Rightline Gear Jeep Build is the vinyl wrap which highlights our fox logo. 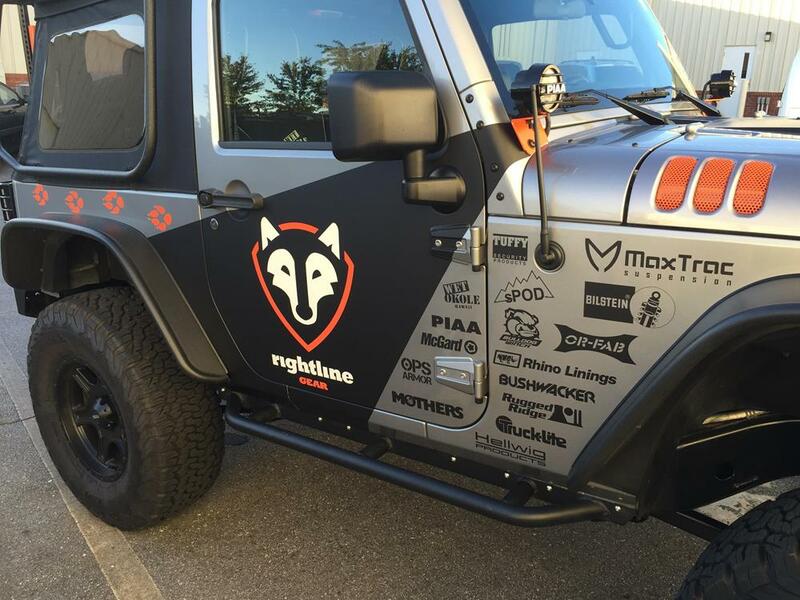 We also wanted to prominently feature as many of our sponsor brands as possible by including their logos on the side of the Jeep. That goal proved to be extremely difficult on a 2-door soft top Jeep, considering its very limited real estate. We went back to the drawing board, or in this case, back to Photoshop, to figure out what would work well. We first tried our logos directly on the silver background of the Jeep, but our fox logo always comes out looking like a racoon when it is placed on a light background. We decided to incorporate a black background just like on all of our products. 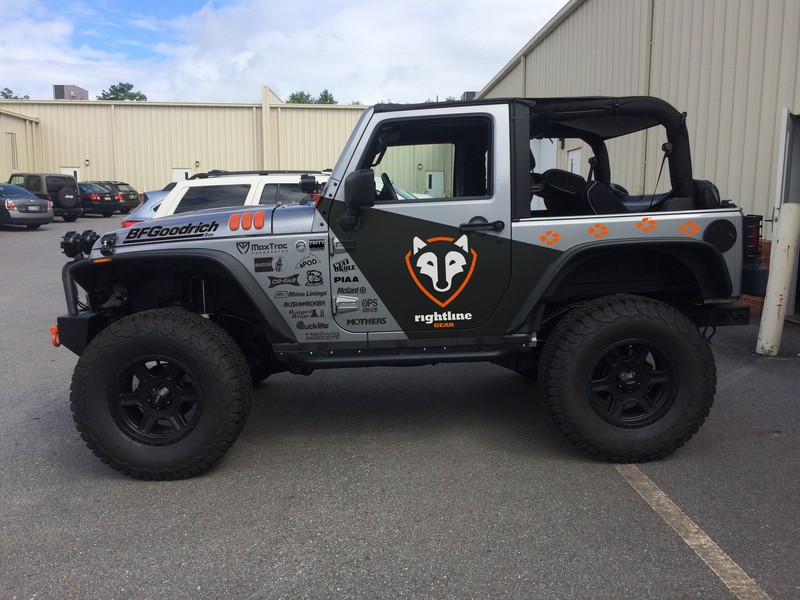 The Photoshop image of the Jeep side came together pretty quickly, we just had to play with the sizing and layout of our sponsors’ logos. In the photo below, the BF Goodrich logo is real, everything else is Photoshopped. We decided to run the black background out from the orange light brackets by the windshield. The black wrap would have to go around the mirror, cross over the door hinge and overlap the door handle- sounded a little tricky! 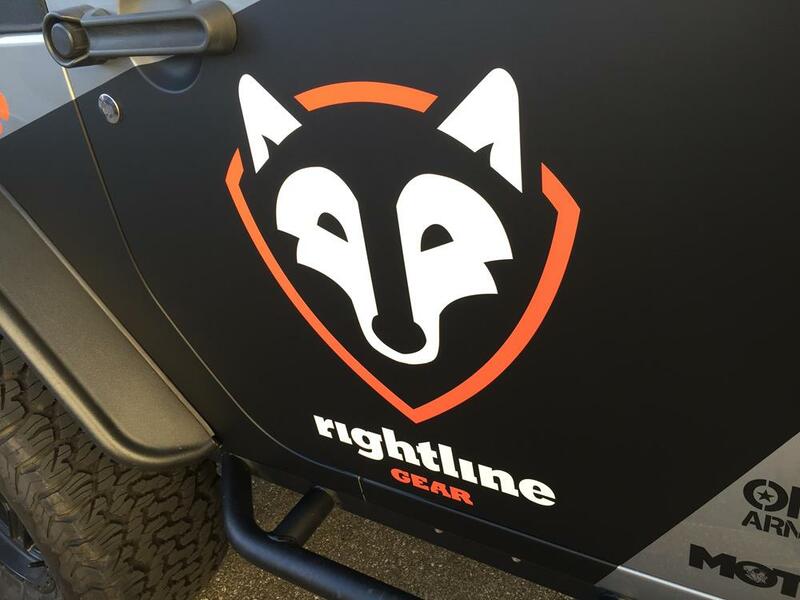 We decided to add the orange fox footprints as part of our Rightline Gear branding (to be featured mainly when we show our Jeep Products). The hood area was a little more difficult. We eventually decided on a black shape that was smaller near the wind shield and expanded towards the front grill. The 3rd photo below was our winning selection. Done this way, the black vinyl would need to go over the vents near the windshield. Another tricky spot when wrapping a vehicle. We decided to work with Dean Jones and his company, Sign 1, in Asheville. Dean had done some work for our company in the past with great results. 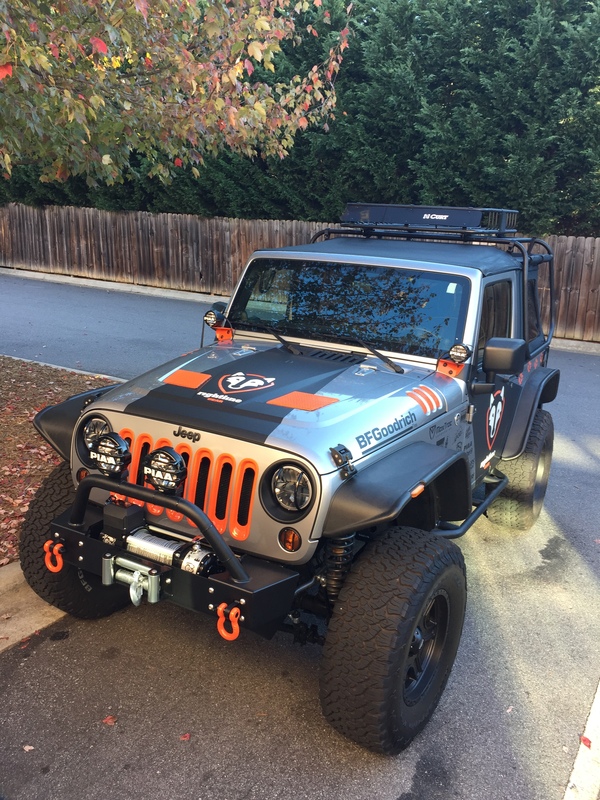 I was interested in using a matte black for our shapes as the BF Goodrich logos were matte black and looked fantastic next to the gloss orange accents on the Jeep. Dean suggested using gloss film to cut the fox logos and then place them on top of the 3M 1080 matte film. 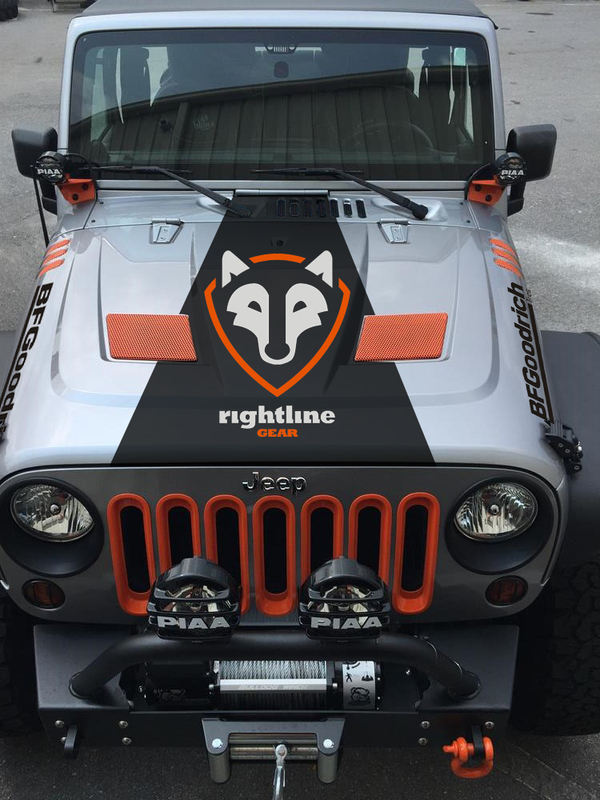 Dean’s team worked hard to produce the fox logo in our Rightline Gear orange color, matching the orange accents on the Jeep exactly. Check out the detail of the wrap around the door hinge, the keyhole, and the door handle. The fox logos really pop off of the matte black background. Dean’s team matched our photoshopped design exactly using their vehicle dimensioning software. It is impossible to tell the difference between the original photoshopped photo and the final result. The vents by the windshield were also wrapped perfectly. Dean got the angle of the black lines on the hood that we had played around with so much in the beginning perfect as well. 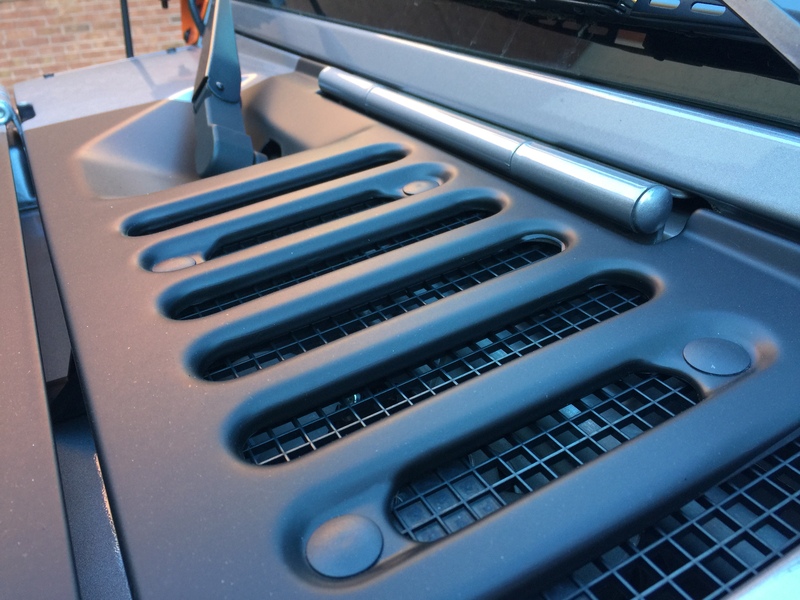 His team had to remove and replace several of the items on the Jeep to get the vinyl tucked away properly. A truly beautiful job!! We will have some more photos to show when the Jeep Build is completed. Dean’s company is truly Sign 1!